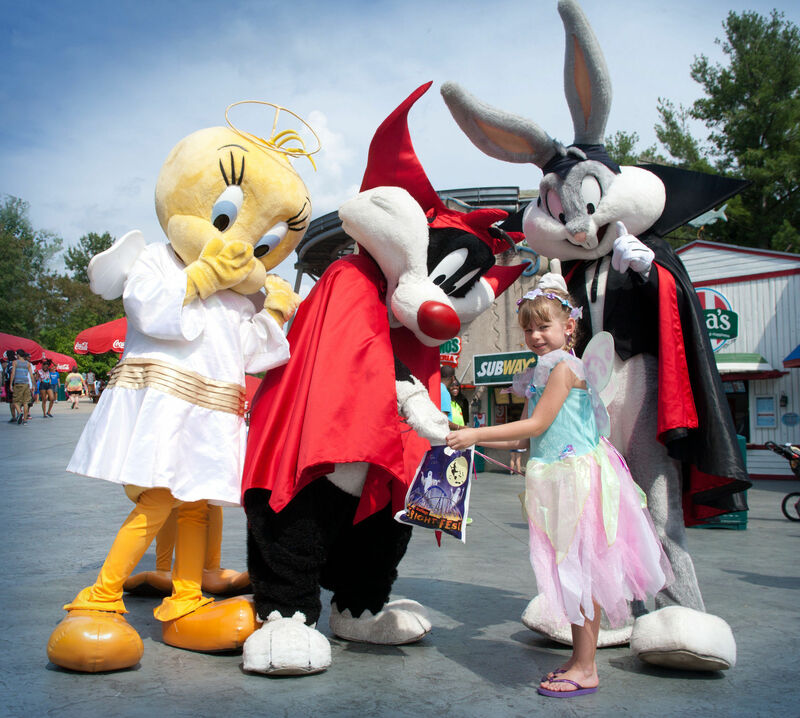 Looney Tunes characters come out for Fright Fest at Six Flags. The Pscyho Circus Clowns are part of the Fright Fest fun. Zombies wander all over Six Flags after sundown. 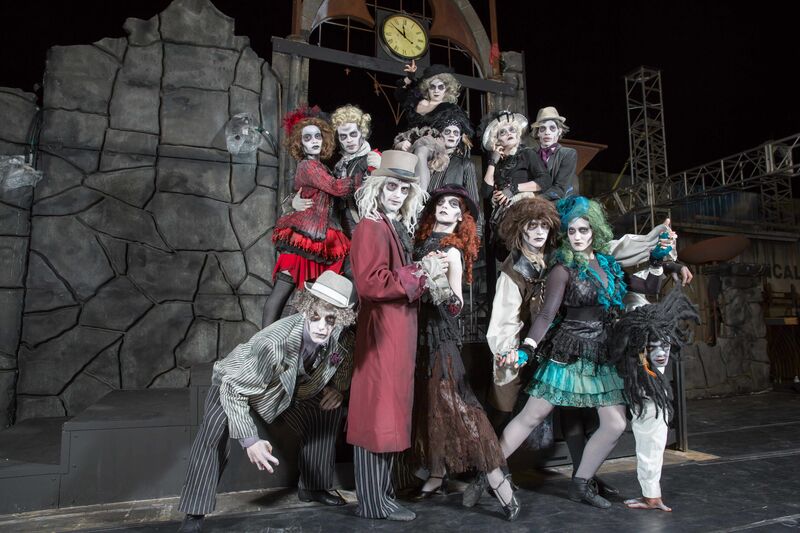 Cast of the Dead Man's Party at Six Flags over Halloween. This year, Six Flags Great Adventure in New Jersey is serving roast visitors during its annual Fright Fest crawling with ghosts, ghouls, goblins and over 200 zombies. Amid thousands of mums, zombies, evil scarecrows, cornstalks, hay bales, cobwebs and over-sized spiders, you can roam the haunted midways and encounter “Thrills by Day, Fright by Night” entertainment. The seven week-long celebration will run every Saturday and Sunday September 20th – November 2, 2014 at this park and many of the 17 other Six Flags themeparks. Fright by Night, which begins nightly at 6pm, is not recommended for children under 12 and those who scare easily. 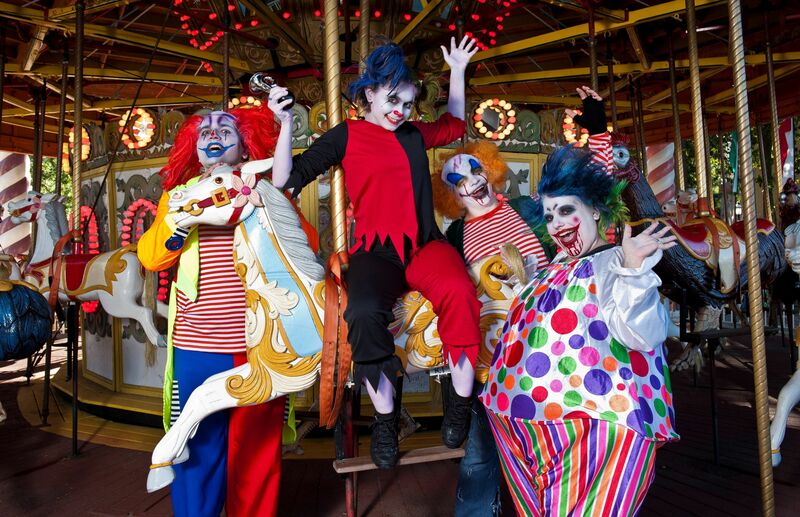 After dark, an array of crazy clowns and angry zombies mingle among mortals throughout the park’s Scare Zones including Circus Psycho, The Bloody Fountain and Bone Butcher Terror-Tory. This fall, the park introduces a new terror trail – Crop Circles, an alien-invasion corn maze. Terror Trail favorites like Voodoo Island, Asylum, Wasteland, Total Darkness and The Manor return to terrorize guests off the beaten paths. In addition to some of the world’s best thrill rides, the theme park’s 140-acre “scream park” will feature two dozen additional Halloween-themed shows and attractions. You can also go on the thrill rides — day or night — you might enjoy the rest of the season: El Toro, Kindga Ka, the Nitro safari adventure and the brand new Zumanjaro: Drop of Doom. Nighttime shows, known as “monstertainment,” include the return of the iconic Dead Man’s Party, Ghoulmaster’s Ghosts, The Awakening, Circus of Thrills and more. Six Flags is also featuring Coney Island sideshow icon Todd Robbins in Professor Zombini’s Freak Show. Terror trails require an additional fee, while all scare zones and monstertainment are included with park admission. Families with younger children can enjoy the park’s famous line-up of thrills for all ages, including Safari Off Road Adventure, SkyScreamer, Skull Mountain and more. In fact, during the daylight hours, most of the Six Flags park has gone G-rated to thrill your tiniest travelers. Families can explore the new Spooky, Kooky Magic Show featuring Raoul, the Duke of Deception, and a new, zany and interactive animal show Paw and Disorder. Back by popular demand, guests can look forward to Trick-or-Treat Trail, Sea Lion Scary Tales, Spooktacular Street Party and the out-of-this-world Doc Snooker’s Halloween Time Machine showing at the Wilderness Theater. Fun for the entire family — unless any of them scare too easily. Some other spooky and fun events that you can expierence during this time period include the Zombie Run, Survival Race, the American Red Cross Blood Drive, the Biggest Loser Race and the Susan F. Komen Race for the Cure. For a bone-chilling time to put you all in the spooky spirit, visit Six Flags Great Adventure in Jackson, New Jersey. Remember, that some of these events need advance registration.